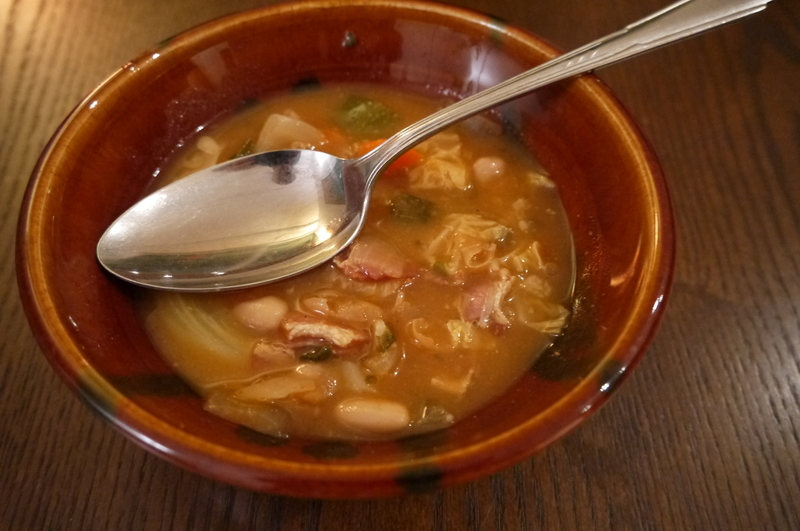 This delicious and hearty soup comes from the Cook’s Illustrated Cookbook, and it is definitely a keeper. I like that it has a lot of vegetables in it, but it gets a boost of flavour from the pancetta (use bacon as a substitute if you don’t have pancetta) and the Parmesan rind. I throw the rinds into the freezer when I have them so I can put them in soups and sauces. If you don’t have one, just add a little extra Parmesan in at the end. Chop the celery, carrot, onions and zucchini into 2cm pieces. Heat a little olive oil in a very large pot oven medium heat, then add the pancetta. Cook until it is lightly browned, about 3-5 minutes. Add the chopped vegetables and cook, stirring often, for 5-9 minutes. Add the garlic, cabbage, 1/2 teaspoon of salt, and pepper flakes and cook for a minute or two, or until the cabbage begins to wilt. Place the vegetables on a baking tray and set aside. Add the beans, water, broth, Parmesan rind and bay leaf to the pot and bring to a boil. Reduce the heat to a simmer and cook for 20-30 minutes. Add the vegetables and V8 juice to the pot and cook about 15 minutes, or until the vegetables are soft. Discard the bay leaf and Parmesan rind. Stir in the basil and add salt and pepper to taste. Serve with olive oil and Grated Parmesan cheese.